As the calendar crawled its way to the new year, Millionaires and non-Millionaires had slightly different views on the economic progress of the United States as it approaches 2018. 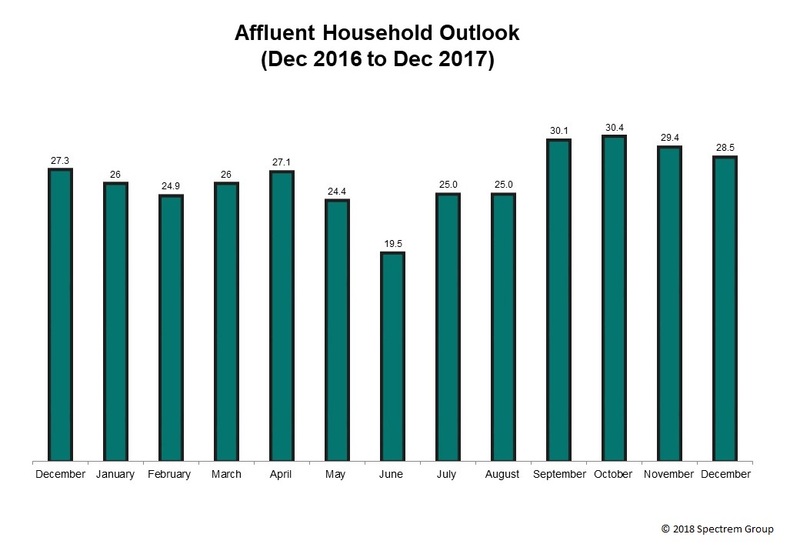 According to the Spectrem Household Outlook, Millionaires are optimistic about the coming months, while non-Millionaires expressed slight pessimism about how the economy will affect household finances in 2018. The Spectrem Household Outlook asks investors to rank four financial components in their lives in terms of how they perceive them to be progressing. In December, Millionaire investors registered an overall Household Outlook of 30.49, an improvement of 4 points from November. Meanwhile, non-Millionaires slotted the Household Outlook at 26.27 in November, a decrease of more than 6 points. However, the non-Millionaire outlook remains above where it was for the first eight months of 2017, indicating a general improvement in attitude among non-Millionaires overall. The overall Outlook of all investors was at 28.50, less than a 1-point drop from November. It is at the lowest point since August of 2017. 57.60, up from 52.00 in November. Both Millionaires and non-Millionaires reported an increase in Outlook for Household Assets, and Millionaires jumped their optimism by almost 9 points. Among non-Millionaires, the Outlook for Household Assets was at the second-highest level of 2017. Female investors were optimistic regarding their assets while male investors reported a downturn. 24.40, an increase from 22.00 in November. The increase reflects an improvement in Outlook of Household Income among both Millionaires and non-Millionaires of between 2 and 3 points. Among Millionaires, the Household Income Outlook saw a 12-point drop from September to November, so the improvement in December is a recovery. Again, the increase was recorded due to an improvement among female investors. 12.8, down from 18.4 in November. Non-Millionaires recorded an almost 20-point drop in Outlook on the Economy from November to December, from 26.96 to 7.63, the lowest Outlook for the Economy since June. Millionaires recorded a slight improvement in their Outlook toward the Economy, after seeing a 25-point drop in Outlook in November. 19.20, down from 25.20 in October. The overall Company Health Outlook was at its highest mark in more than 10 years in November, so a drop in December is not unexpected. The largest drop in December was among non-Millionaires, but it is still at 17.80, which remains higher than an Outlook seen since May of 2015. The Company Health Outlook jumped for both Millionaires and Non-Millionaires, and for Non-Millionaires it reached 28.70, the highest mark since October of 2007.